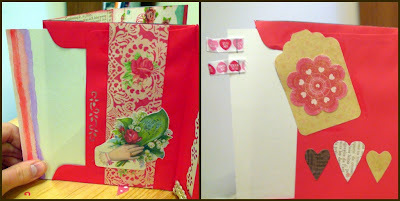 Sisterhood of the Crafty Pants: I Luv Valentines! A little somethin somethin for that special someone.. So after years of making cheap coupon books for Mother's Day, I thought my coupon-book-making days were over. Guess I was wrong! All you need is a few envelopes and anything scrapbooky. And glue it to the FRONT of the other envelope. Repeat this step a 3-46 times, depending on how big you want your book/card thing to be. Now comes the fun part. Decorate to your hearts desire. Make coupons or love notes or whatever to stuff into the little pockets. The little cards for writing junk on.